Good nut that from Wagner, but Amla will probably be disappointed to be bowled like that. He didn't move his front leg at all (after his trigger) and played round a straight one. Yes he's gone, great over from Wagner. Cleans up Amla and bounces out Duminy. Pretty sad that Amla's been declining quite a bit recently. Is Neesham a better bowler than I thought he was, or have NZ gone in with only two proper seamers in a home test? Amla scored a hundred in the Test prior to this one, so he's going ok. He needs a fair share of luck like last Test vs SL when he was dropped very early. Do hope he still has a few years left in him though. SAF tumbling here, could be out sub 300 here. Yeah hopefully keep them under 320...Not sure if I like the look of the kiwis batting line up, need some descent score from our big names. 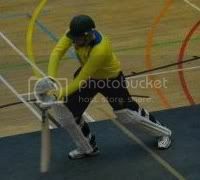 In saying that, really wanting Raval to get runs ! Page created in 0.556 seconds with 39 queries.